Buy 1 for $18.15Buy 2 / Save $0.97!Buy 3 / Save $3.63! Acacia Flower is obtained from the most prolific of the over 700 species of Australian Wattles, the Black Wattle. Acacias have had significant nutritive associations with health since before recorded history, an interplay that continues to the present day. It is collected from wild or cultivated trees over six years old and must be allowed to mature for a year before being used for health benefits. Acacia Flower contains from 24 to 42% tannin and also gallic acid. Its powerful astringency causes it to be extensively employed in tanning. It has special use in diarrhea, mainly in the form of a decoction. The decoction also can be used as an astringent gargle, lotion, or injection. In India a liquid extract is prepared from the bark and administered for its astringent properties in doses of 1/2 to 1 fluid, but the use of both gum and bark for industrial purposes is much larger than their use in health. 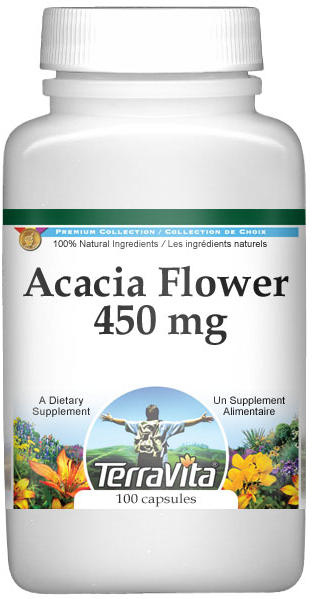 Acacia Flower can also be tried to help support dysentery.